● Interface: USB 3.0 for faster speed. 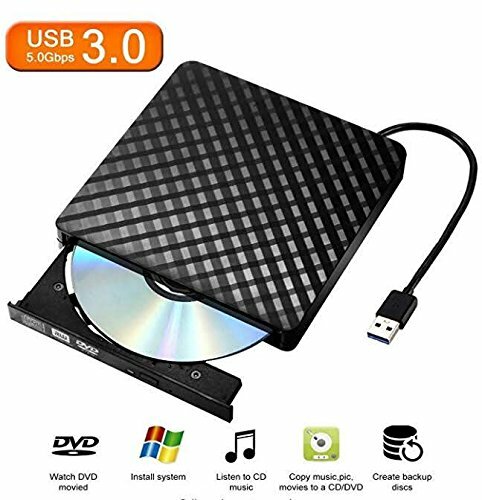 The USB CD DVD Drive is compatible with USB 3.0/2.0/1.0. ● Support Systems: Windows 98/SE/ME/2000/XP/Vista/Win 7/8/10 Windows Server 2008, 2012/Linux/Mac OS System etc. ● Easy to use. Plug & play. No external driver nor power needed. ● Support Systems: Windows 98/SE/ME/2000/XP/Vista/Win 7/Win 8/Win 10/ Windows Server 2008, 2012/Linux/Mac OS System etc. ● Supported media types : CD-ROM, CD-R, CD-RW, DVD-ROM, DVD-R, DVD-RW, DVD+RW, DVD+R, DVD+R DL, DVD-R DL, DVD RAM. ● Reading Speed : CD-ROM: 24x Max; DVD-ROM: 8x Max; DVD-ROM (DL): 6x Max. ● Writing Speed : 24x CD-R , 8x CD-RW, DVD±R: 8X Max; DVD±R DL: 4X Max; DVD-R±9: 2.4x Max. ● Rewriting Speed : DVD+RW: 4X Max; DVD-RW: 4x Max; CD-RW: 10X Max; DVD-RAM: 3x Max. ● Memory Cache : 2M. This External CD Drive is equipped with USB 3.0, a high speed interface. It adopts an intelligent burning technology which enable faster data transfer rates & a more stable data transmission. ● Customers using Windows 10 are advised to Install VLC Media player in order to Play DVDs and CDs. The reason is, Windows didn't integrate the Media Player APP in the latest Windows versions. ● Before using the CD- ROM drive, be sure your computer has a"Media Player", make sure Windows media player supports the media format you want to play. ● The driver may not work properly if your computer has virus, please make sure to clean your disc in case of any malfunctioning. ● 1 x External USB CD drive with USB 3.0 Cable (CD not included). ● 1 x User Manual. [Plug and Play]: Easy to use CD & DVD Player Portable, both player and burner, run automatically right after connection with your device, no extra settings or driver needed. [Versatile]: Support CD, CD-R, CD-RW, DVD-RW, DVD±R, DVD±R DL, DVD±RW & DVD-RAM, run on computer, laptop, Macbook, Chromebook, Google Pixelbook, video games, almost all devices with USB plug. [Fast Data Transfer] USB 3.0 is the newest USB data transfer technology. It allow a fast transfer of your data & power the driver as well. You won't need external power source. [Fast Writing & Reading Speed]: 8X speed DVD±R writing, 8X speed DVD-ROM reading. If your PC runs with Windows 10, we suggest to install VLC or any suitable APP in order to play media files because newer Windows versions don't integrate Media Player APP. [User Friendly] Slim & lightweight with shockproof functionality, error-correcting ability and noise reduction functionality. If you have any questions about this product by TOBSKBY, contact us by completing and submitting the form below. If you are looking for a specif part number, please include it with your message.